Guruvayoor is a temple town. Sree Krishna Temple here is one of the leading pilgrim centres in India. The influence of the temple is such that no matter how much the town grows, it stays on as a temple town. 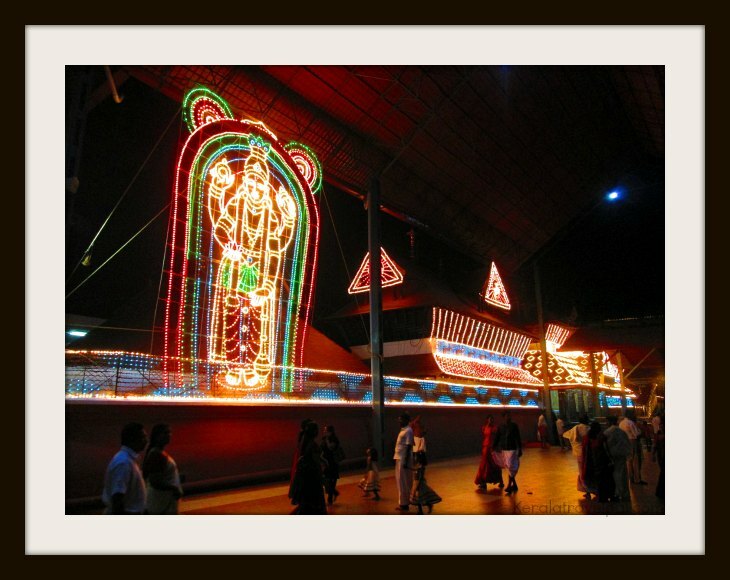 Guruvayoor (also Guruvayur) is located in Central Kerala, about 29 kms from Thrissur town. Temple, the centre of attraction, is the centrepiece of a very large complex that houses arcades, buildings and large ponds. Renovation works done in the last few decades have amicably blended modern looks with ancient ambience. Deep within the temple building is the sanctum sanctorum where the idol of Sree Krishna is. Devotees stand in queues for several hours to reach the sanctum for darshan (worship). The idol is thousands of years old. Legends say that Krishna himself gave it to Udhava, his close friend, just before he vanishing into the sea. He instructed Udhava to seek the help of Brihaspathi, the mentor of Devas, to find a proper place to install it. Guru (Brihaspathi) and Vayu (lord of the winds) after a long search for the suitable location met Parasurama. He guided them to this location. 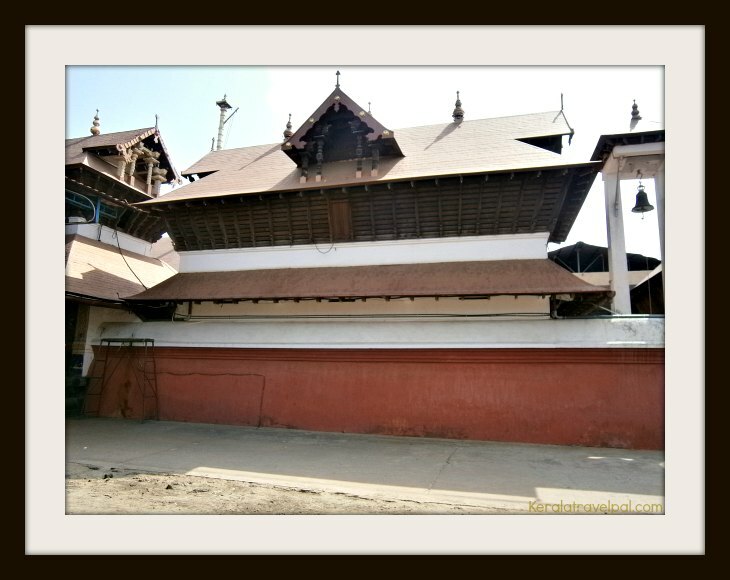 The place where Guru and Vayu installed the idol came to be known as Guruvayoor. Sree Krishna is an avatar (incarnation) of Maha Vishnu. The deity at Guruvayur is commonly called Guruvayoorappan. Guruvayur temple has strict entry restrictions, and the one that matters the most is that only Hindus are allowed inside. Adherence to a dress code is also a must. The only accepted dresses are - mundu (Kerala dress) for men and sari or salwar for women. Men have to be bare-chested and not with their shirts on. Guruvayur is worth visiting even without entry inside the temple. So much tranquillity within a crowded town! From dances and music to facial expressions, sanctity reflects everywhere. Sights and smells elevate mind to an experience that is quite unique. The vibe just needs to be felt! A lot of people intensely desire to visit here at least once in their life time. Just imagine the glow they are going to have in their faces up on reaching here. You may see a few of such faces now and then. It takes a lot of such pilgrims to make Guruvayoor the fourth most visited temple in India. The temple is also a very desirable venue for weddings, baby rice feeds and thulabharams. In case you wondering, thulabharam is a peculiar and interesting ritual. The person offering it sits on one of the pans of a giant two pan weighing scale. He is weighed against the material (ghee, butter, sugar etc) he wishes to donate! There is quite a large area just outside the temple where you can hang out and take pictures. The open spaced Melpathur Auditorium near the temple is always packed with people. One of the highlights of Guruvayur trip is to watch artistic performances of krishnanattam, bharatanatyam and mohiniyattam held here. 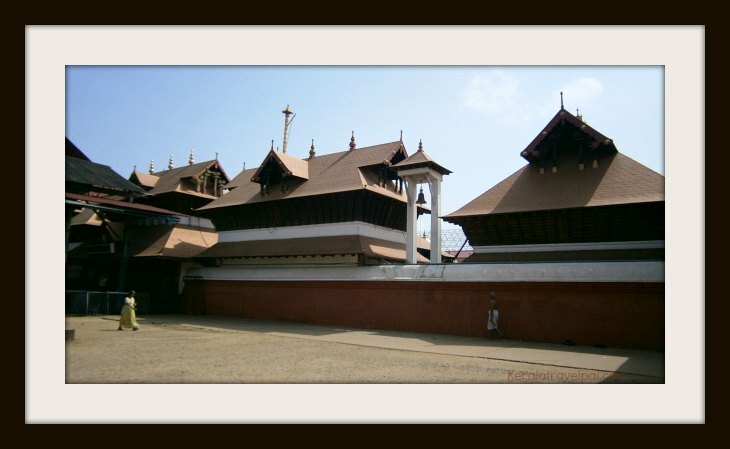 It is also the venue of the marathon carnatic music fest (10 – 12 days) during Ekadasi festival. Elephants participate in some of the temple rituals, so a few of them are always kept just outside. An elephant rings a bell inside the temple during evenings, a ritual that attracts several spectators. Arcades near the temple have plenty of small shops selling Kerala souvenirs and religious artefacts. I have purchased gifts for my overseas friends from here. In my experience, the prices are reasonable and standard. I encourage a bit of price check albeit. Another good thing is that there is no hawking or touting. It is hard to ignore the impressive range of snacks and sweets. Colourful halwas, extra large pappadams, murukkus, banana chips.......you name it. The idol inside the sanctum faces east. The main entrance to the Temple is also in the east, although there are doors facing all four directions. This eastern entrance is called Kizhakke Nada (East Gate). However, the entire eastern part of town also shares the same name. Similarly the western entrance of the temple has lent its name Padinhare Nada (West Gate) to the whole western part of the town. Being a temple town, most eateries are vegetarian. Are you a fan of veg food such as dosa, idli, thali and vada? Then you are in the right place. Saravana Bhavan, Indian Coffee House, Woodlands Restaurant, Annapurna, Surabi Restaurant, Mangalya, Kaustubham......Well, there are plenty of places good enough to give a try. Evenings around the temple are quite special, so plan your trip accordingly. If you are a devotee looking forward to darshan here, a visit to Mammiyoor Siva Temple (at 1 km) is almost inevitable. The major tourist spot nearby is Anakotta, the elephant sanctuary belonging to Guruvayoor temple. Other interesting places within the range of 10 kms are Palayur Church, Chettuva back water and Blangad beach near Chavakkad. Guruvayoor is 29 kms from Thrissur town and 108 kms from Cochin. Distance to Nedumbasseri Airport, Cochin is 78 kms. Guruvayoor can be accessed by road and train. Private and KSRTC bus services connect Guruvayoor to major Kerala towns. Nearest towns : Kunnamkulam at 8 kms, Chavakkad at 4 Kms. Bus Station : Guruvayur Private Bus Station at East Nada, KSRTC at West Nada. Taxi/ Auto-rikshaw Hire : Available in the town. Railway Station : At East Nada. Direct trains to Thrissur and Eranakulam (Cochin). Air port : Nedumbassery Airport Cochin (COK) at 80 kms, Kozhikode Int’l Airport (CCJ) at 100 Kms. Food Options : Variety of veg restaurants. Accommodation Options : Plenty of hotels, lodges and serviced apartments ranging from budget to luxury. Nearby Attractions : Elephant Park (Anakotta), Palayur Church, Chettuva backwater and Chavakkad beach are within a few kms. Major tourist spots in Thrissur district are - Athirapally and Vazhachal falls, Peechi Dam and wildlife sanctuary, Chimmony wildlife sanctuary and Kerala Kalamandalam. If you are visiting Thrissur town, interesting places in the locale are art and archaeological museums, Thrissur zoo, Puthan Palli, Vilangankunnu and Shakthan Thampuran Palace.